Can we have a complete secret(s) list? Edited by lowenz, 22 August 2018 - 05:34 AM. 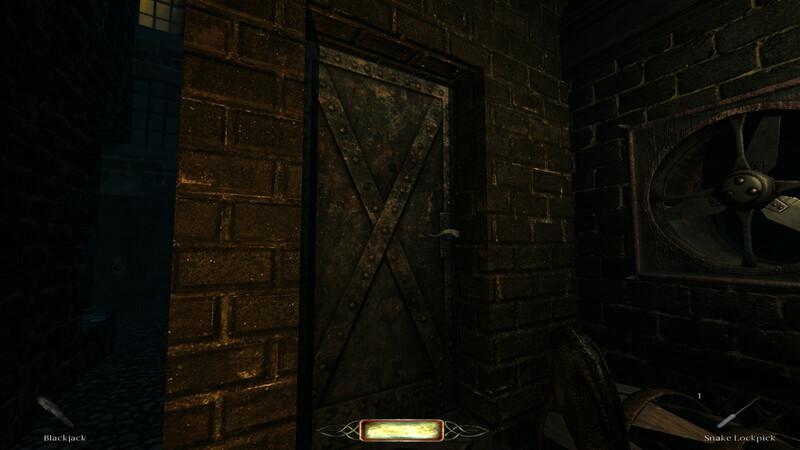 1) Why is this door frobbable but there's nothing (noclip! ) behind? Edited by lowenz, 22 August 2018 - 07:11 AM. 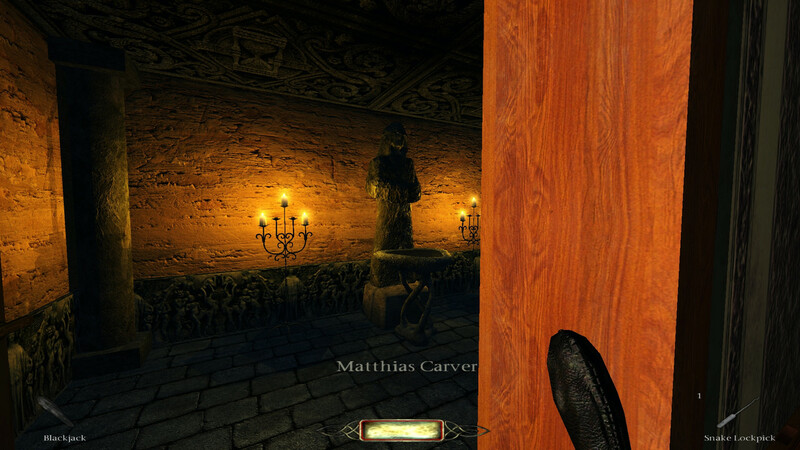 2) here there's an invisible INTENDED ladder?! Edited by lowenz, 22 August 2018 - 02:04 PM. 1) yes that is a bug. Not sure how to fix it either sorry. 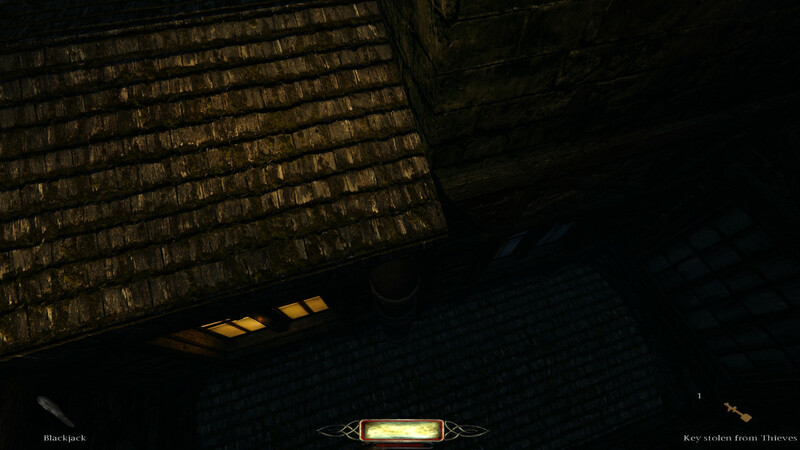 2) The image is too dark for me to see things clearly but I think youre up on a roof? If so there are pipes the player can climb. Apart from that there arent any ladders. 2) Yes, so it's intended they behave like a ladder. Thanks! Suggestion for the secrets: why not use the city HUB for the secrets (closed shops, inn, delivery yeard, etc. )? Now the HUB is nearly "empty" of interest. Because secrets are optional and I want to keep them spread over most of the mission. The hub evolves throughout the campaign so each act you'll find different shops open and places to go, eventually nearly every location within the hub gets used eventually. just wanted to hop in to say that the Northdale campaign is by far the most exciting thing that happened in this mod for me (well, the Crucible of Omens campaign was equally exciting, but, unfortunately, discontinued...). Not to talk down other's work, but, Act 1 really has been another level, because of the things mentioned in this thread, like, the city hub, the whole level design, and overal consistency of the mission. I just can say that i'm very hyped, also by your post here: http://forums.thedar...t-now/?p=424938 Can't wait for Act 2 (and the others, ofc). Thanks for the words of encouragement! Im still plugging away at Act 2 which is getting closer and closer, just waiting on some really cool custom models and some voice acting and then I can piece it all together. My main focus with it and all of the acts is to keep choices open, like you have multiple ways to break into the bank each with their pros and cons. Act 3 has also come much further since that post and is down to one final area which is the city watch compound but all other areas are polished and finished. Act 4 which is a cathedral snowy mission is about halfway done now too. So theyre all making healthy progress but now Im stuck on how to release it all though. Part of me likes the original idea of releasing them close together, another idea I had was to release all three missions in a single campaign all at once like a trilogy, or I guess I could just go back to how it originally was where act 2 gets released faster and then I focus on act 3 getting done and so on. Seeing as Act 2 is so close its tempting to just release that but then there will be a wait until Act 3. Albeit not too long. I think after all the positive feedback you've received for the first act the next one should come soon to relieve your eager audience. Besides, your argument for releasing them close together is that there'll be less waiting for the next installment, but this is paid for by waiting much longer for any installment. The main advantage I'd see in releasing them en-bloc is that you're free to go back and make changes to the acts until they all fit together how you want them. If you're already 100% certain of how all your 4 acts will play out then this becomes a minor point. Regarding release as a campaign: while it'd be nice to see this feature getting used, it'd restrict those who want to replay a specific act, especially if it's after a reinstallation/redownload. Maybe you'd want to release the acts as individual missions in addition to the campaign format anyway? What version of tdm are you playing on? You shouldnt be required to have the contract selected in order to complete it. Could you please post the exact step by step you did to cause this crash. Also does the crash happen all the time or some of the time? Going forward as contacts get more complicated I dont want to have any crashing going on so you might have stumbled onto something big here! I had finished the core of the mission objectives and set about completing my "secrets" hunt including completing 2 missions I picked up at Finkel's Shop. The first contract involved Garrett's Print Shop, so I went over there and lock picked my way in. Snuffed out some candles and read some stuff on the counter. Found the ledger on the shelf and frobbed it. Scribble noises indicated I was completing my task. But soon after the Completion Window popped up, the game crashed to desktop. Started TDM again and repeated the sequence, thinking it was a once-only problem, but same thing happened. Next time I quick saved after entering Garrett's Shop then went straight to the ledger without snuffing candles or reading the counter book. Crashed again. I tried a couple more times and was about to inquire here about my problem when I thought maybe I have to "initiate" the contract in order for it to work. So instead of having the lock picks selected, the Contract was selected. IT WORKED !! So out of, maybe, 5 or so attempts, the ONLY time the game didn't crash was when I had the Contract selected. No one else has experienced this ?? In order to start a contract the player does have to open the readable at least once. Doing so makes the relevant entities in the world interactable (as now you know what to look for). After a contract is complete the loot is applied (shortly after the completion) window. Im thinking maybe something is going awry during that event. This is something Ill take a deeper look at going forward. Thank you for your feedback on this all too, that helps to narrow things down. The Second Contract I had no problem with. But I had already read it. When it came time to frob the Cask I HAD to have the Sleeping Potion selected. So it looks like my issue was particular to the Contract of changing the ledger. I MUST of read that Contract prior to the crash otherwise I would have no idea to go to Garrett's Shop. Strange. I only got 3/7 secrets on my own though. The ones I didn't get were "nicely done" and, typical of secret hunts, make you explore every corner of the map. One last note on the problem I encountered wrt Garrett's Ledger......The crash appeared to happen at the end of the sound/music that accompanies completion of the task at hand. Could be a coincidence but it sounded jerky or raspy, choppy, then whoosh....crash to desktop. Edited by CountMorillonite, 04 September 2018 - 09:42 AM. Glad you had a good time! Im currently working on act 2 and act 3 but theyre both still quite a while off. The bug you experienced is very strange, the mission was built and tested on 2.05 however it should still work on 2.06. When I get to the contracts in my current WIP Ill be sure to pay close attention to them. I noticed that you used "Custom" sounds. This comes from a fan mission web page under EFX Reverb. Maybe something is going on there. Every dark mod mission uses custom sounds with some small exceptions. If that was the issue youd be seeing it a lot more missions. So I hadn't had a TDM mission since 2 years and played some 2018 missions. But this one was the best I could remember. When could we expect the second act? Edited by Berny, 22 October 2018 - 03:58 AM. In terms of a release date my current goal is to have both act 2 and act 3 out by spring 2019. They're both quite far along and I plan on releasing them very close together so at least the wait between act 2 and 3 wont be as long as the current wait is. I loved this FM so much! This is AAA quality work, the sort of thing I would love to see more often in TDM. Two things stood out to me in particular. The first is the way you defined the guard mechanics. Guards don't attack you by default, instead they will act if they catch you doing something you shouldn't do. I think this kind of enemy design for main areas is excellent! Firstly it makes more sense from a logical perspective, since unless you're a notorious criminal or the city is under curfew, there's no reason for the city guards to attack you automatically... and both of those are overused reasons in existing FM's. The second reason is that, although it might sound more challenging and exciting for guards to chase you all the time, this gives you a factor of consequence and introduces an optional penalty that forces you to better time your actions (mess up and you'll have the extra challenge of needing to hide from the guards). A third positive aspect is that it makes exploring the public areas easier... many FM's are a bit annoying for first timers as you have to dodge a lot of guards while learning the layout. You're truly one of the greatest FM creators. I'm eager to see part 2 of this once it will be out. Hopefully you're planning to make it an actual campaign rather than individual FM's: There aren't many of those even for existing series, the campaign system of TDM is seeing little love still.